School Bus Life | Back on the Road with New Video! Yesterday we departed Pensacola, Florida. Before leaving we stopped by our favorite grocery store Publix to pick up a couple things. We said goodbye to our favorite store clerk, Matt. When we were close to Mobile Alabama we stopped at Bass Pro Shop and Julie made Taco salad for lunch. It was really good! On our way through Mobile, Alabama we caught a glimpse of the USS Alabama. There were some low bridges along the way that went under water and parts of the city. Can the Bus make it? Oh yeah! For the most part our trip is going well. On our way through Mississippi we were getting some drone footage of the bus driving down the road. Somehow the drone got out of range and returned to its original takeoff location. We had to turn around to see if we could find it. When we made it back to the take off location we saw the drone sitting on the top of a 50' tree. It was a pine tree so there was no low hanging branches so the tree could not be climbed. After a lot of trial and error we found that my chalk line was the only hope we had to get the drone down. I pulled out most of the line and threw the reel end into the tree. I had to do this about 30 times before it finally got close to the drone. I was able to shake the tree enough to loosen the drone causing it to fall out of the tree and into some think brush. The drone is unharmed! We stopped in Magee, Mississippi and met some new Good News Bus fans. We gave them a tour of the bus. We stayed the night in Yazoo, Mississippi. Today we crossed the Mississippi river and into Arkansas. Here is our Road Trip update from last night. We will try to post one every night detailing our trip. Great post. I pray that the worst that could happen on this trip has already happened. 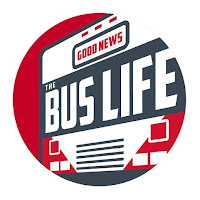 May you meet more Good News Bus fans and reach your destination safely. Hey, are you guys coming through Kansas City? We will be in Witchita today!